First, I should like to say a little about myself so as to explain how I know what follows. I was lucky enough to get a good education because my parents could afford it, I went to university at a time when it was unusual and then joined the intelligence community. I had an uneventful career until a mild stroke left me with a slight speech impediment and I was assigned to archives during the final years before my retirement. The World War II archive section is closed off from view and most is now converted for computers in the restricted section, but on rare occasions I did have access to read up on the war and how it happened. Forget everything you read in the history books. Politicians habitually lie so swine flu, Weapons of Mass Destruction, Kennedy’s assassination, the moon landings, Iran, the banking crisis, the Holocaust – none of it is the way it is portrayed in the media. Late in 1941 the German Luftwaffe dropped pamphlets over the Liverpool area, we had one of these in the files and in it Hitler tried to warn the British people about the coming New World Order. He asked them to stop attacking Germany, and realize that Jewish bankers controlled the Soviet menace and Russia and its Jews were the common enemy. The pamphlet went on that Britain should keep its empire, while the US was demanding we give it up. Hitler wanted a strong Britain against Russia and the Jewish bankers, and he warned of Winston Churchill’s desire to turn the Germany versus Russia conflict into another world war for international Jewry. America was planned to come into the war from day one and Roosevelt knew it. Because Hitler was the only man in the world to stand up to Russia and its Jewish controllers, many in the USA and Britain initially supported him, until it was made a crime. Let’s look from these files and some fallacies about who Hitler was. 1. He was not a Rothschild: recently the Hitler family grave and the headstone was moved, part of this was to do DNA tests, resulting in no sign of any blood links to the Rothschilds. 2. 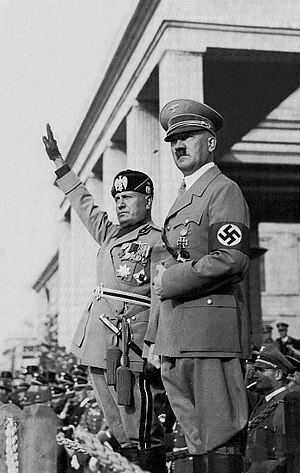 Hitler wanted to rule the world: more nonsense, he wanted to re-unite the German speaking peoples. Britain had spies right through the Third Reich and officially our intelligence said Hitler was a threat to Russia not Britain. 3. Hitler was a cruel psychopath: he was very tough yes, but Hitler loved animals and children and all animal experimentation was outlawed during his premiership. However, he did bring in a euthanasia law that ruled that the severely handicapped should be given euthanasia. Churchill also agreed with this policy. 4. He was sexually malformed and a homosexual: Hitler’s doctor Theodor Morell claimed Hitler had wounds from WWI but was not malformed, and definitely not homosexual. In fact any sexual perversion could land you into the work camps. There is a book which purports to be by Doctor Theodor Morells but don’t bother reading this. 5. Natzi is abbreviated from zionazi: not true this really comes from Nationalsozialismus, or National Socialism, which meant the money in that country for the benefit of the people in that country, not international Jewish money-brokers, Natzi is also short for Nazerite or follower of Jesus of Nazareth. 6. Hitler was a British agent: more nonsense. Hitler loved the British people and its cultural way of life and saw all Anglo-Saxons as brothers, but was totally committed to the German resistance to the Jewish takeover that held Russia, Britain and America. 7. The camps were death camps where people were gassed to death: not true, the camps were for criminals and those who did not support Germany, these people were made to work allowing German nationals to concentrate on the war effort. It should be said that Rothschilds who funded the war effort refused to help the Jews in the camps, despite Hitler asking several times to discuss this. So when you see emotive hate films about WWII and the Holocaust see it in the context of the propaganda it really is. 8. Angela Merkel is not Hitler’s daughter as claimed, this is so childish as to be laughable. 9 Why did Hitler hate Jews? Hitler’s chauffer and one of his chefs were Jews, two of the most trusted job in Germany during the war. Moreover, 150,000 Jews served in the German armed forces during WWII <http://www.kansaspress.ku.edu/righit.html> . So Hitler did not hate Jews, just those who hated Germany. Incidentally as well as 150,000 non-Zionist Jews <http://just-another-inside-job.blogspot.co.uk/2007/04/150-000-jews-in-hitlers-army.html> , many Indian volunteers also served in the German Wehrmacht <http://www.feldgrau.com/azadhind.html> . 10 Rothschild persuaded Churchill not to bomb German factories, as he wanted to seize them as war reparations. So the war was taken to the wives and families of German soldiers, in an effort to break Germany utterly and completely. This entry was posted in News Archive and tagged Angela Merkel, assassination, bankers, banking crisis, Britain, British agent, dna, euthanasia, German, German resistance, Germany, Hitler, holocaust, illuminati, Indian, iran, Israel, Jesus of Nazareth, jewish, jewry, Jews, JFK, John F. Kennedy, Kevin John Field, Luftwaffe, moon landing, murder, Nazerite, Nazi, Nazism, New World Order, Roosevelt, Rothschild, Russia, soviet, Theodor Morell, Third Reich, Wehrmacht, Winston Churchill, wmd, World War II, Zionist by renaissancelearningfoundation. Bookmark the permalink.